For today's Christmas Card, I've stamped my image - Worship the Lord from Our Daily Bread Designs, in Black Archival Ink on watercolor paper, and colored my image using the Marker Water Coloring Technique. 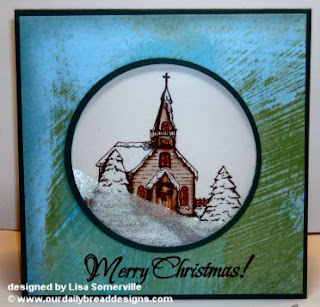 I then used the Faux Rim Shaker tutorial found here on my blog - to complete my card. Love this! I love the shaker idea!! Cool!